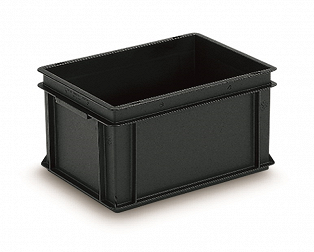 Stackable antistatic container 600x400x120 with solid sidewalls & solid base with 2 shell handles | George Utz Ltd.
RAKO ESD euro container, PP EL, black, ext. 600x400x120mm, int. 553x353x114mm, 20 L, 1.66 kg, solid base, solid sides, 2 shell handles, protects contents from electrostatic discharge.